If you are looking out for the best training institutes for Professional photography, Congratulations! You have finally spotted a perfect Institute. In order to get titled yourself as a professional photographer and kick start your career in photography field, one has to undergo a highly specialised and professional led training course which enhances the person’s skills and moulds him as a professional in creative photography. Rakesh Pratap Kurra, a highly talented professional photographer takes the responsibility of pot making tomorrows talents in photography in his photography training institute. He is well known for his creative photo shoots, kids’ photography, kids modelling, fashion photography etc and done more than 50 fashion photography workshops in cities like Hyderabad, Mumbai, Goa, Bangalore and Vizag. He also has a great experience in shooting with professional models and always maintains a professional make up and crew. His work speaks more than the words. It would be very interesting and encouraging to learn the things directly from a well versed and established person. Rakesh Pratap kurra’s training classes follow unique concepts and different methodologies to bring out the talent from the trainees in an ease and enthusiastic manner. Practical Learning: We believe in learning the concepts directly and implementing them in practical world. This helps to understand the concepts better than theory classes. 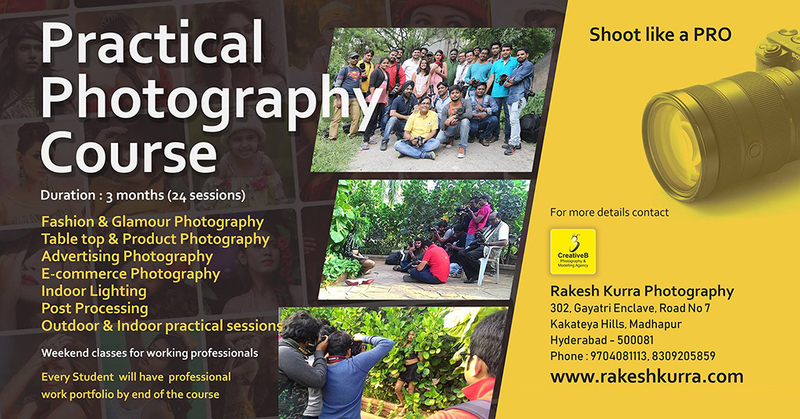 Hence, our students enjoy the benefit of practical photography classes from the day 1 of their course. Working directly with the Professional: Here the instructor, Rakesh Kurra is himself a well known professional photographer and takes up the classes for the trainees. He not only teaches the tips and techniques, but also involves the students in his photo shoots so that they can learn in a lively manner. Creative and Committed: The training courses not only cover the basic topics but also include the trending and creative concepts of photography. We keep our students updated and upgraded on the latest technologies and different themes of photo sessions. Short-term: A crash Photography course which covers all the topics thoroughly and ensures the complete guidance to the trainees who wants to learn in a single day itself. Long-term: The default 12 weeks photography course which we regularly follow and suggest to the people who approach us. Weekend classes: This Photography course is specially designed for the working people who choose to learn photography as a passion and hobby. Experience the excellence of our training classes before you make a choice by attending our photography workshops. We promise you world class training without any compromises. If you are a person with great thrive for photography in your bones then don’t wait too long to fulfil your dreams. Come join us and gift yourself the most excellent Professional photography skills with our photography training modules. We offer our services in Hyderabad and Bangalore. Its never too late in learning the new things.